Are you looking for homes in Sun Lakes that are single level? You’ve come to the right place! 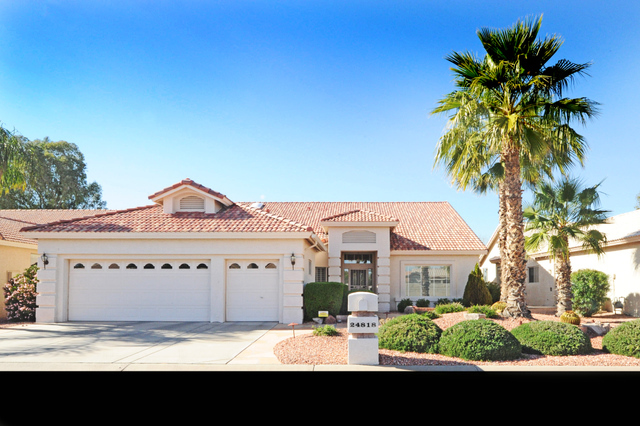 Sun Lakes AZ has both single and two level homes and this blog will show you what is available in single level homes for sale. Many who are moving into an active adult community are seeking a single level home although even the two level homes in Sun Lakes offer main floor living. Two level homes have all living areas including the master suite downstairs. Upstairs are two guest bedrooms with a guest bath. Single level homes in Sun Lakes offer 1000 to 2800 square feet of living space and normally consist of two bedrooms, two to two and a half baths and sometimes a separate office or den. They may be a villa with one shared wall, a golf course lot home, private lot or on the walking path or greenbelt. Sun Lakes Arizona homeowners enjoy resort style amenities with golf courses, tennis and pickle ball courts, fitness centers, walking paths and lakes, restaurants, bocce ball and parks and many social opportunities to meet new friends. See all Sun Lakes AZ single level homes for sale or visit our website at MySunLakesHomes.com to search for all Sun Lakes AZ homes for sale.